Hamby Home(in)stead ...: Seed success! I've been keeping an eye on my garden. 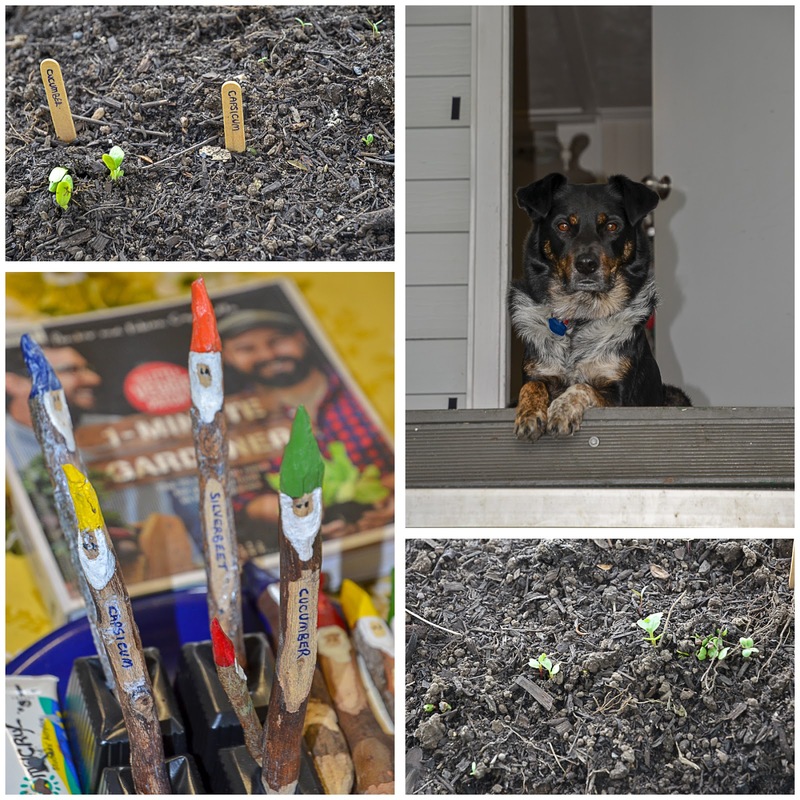 On Tuesday there were tiny seedlings but given their placement, I wasn't entirely convinced they had sprouted from the seeds I'd planted! When I checked again yesterday, there were small seedlings next to the original craft stick markers. Even better, some were in lines, which Erin agreed was evidence of "real" plants (not weeds)! Hooray! 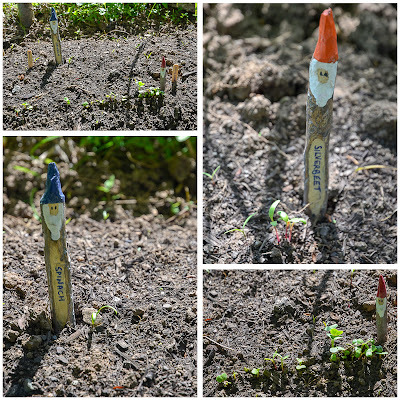 Given that sprouting success, I worked on finishing my first round of gnomes. (They needed labels and several coats of sealer). 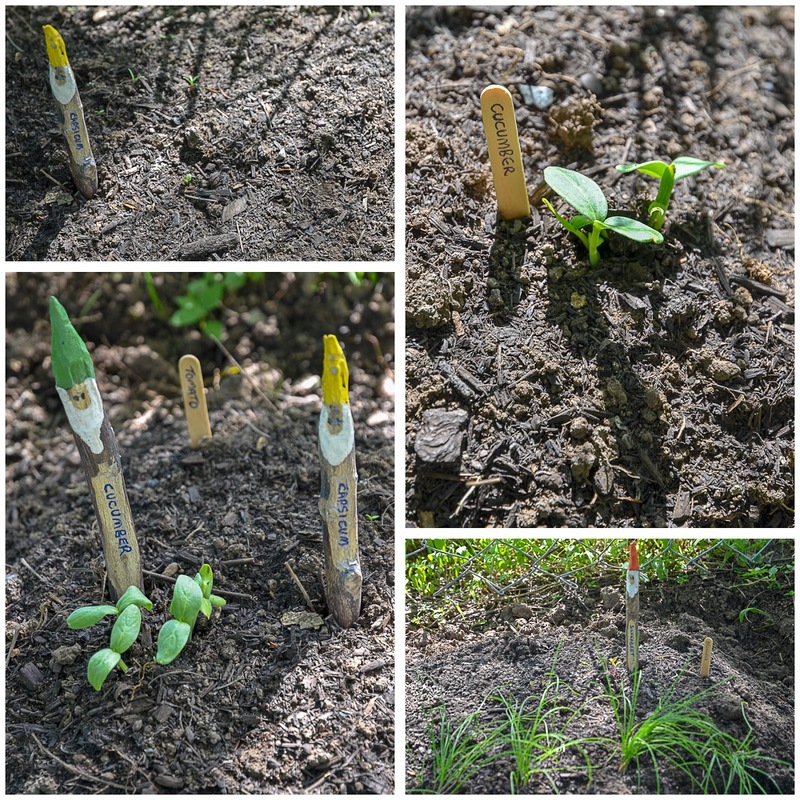 I placed those guys this morning - and was heartened to see more baby plants emerging. How good is that?! At this stage there are cucumber, radishes, silverbeet, spinach, just one capsicum and praps a few tomatoes. 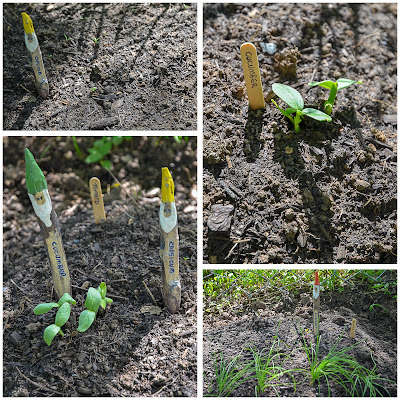 One of the butter beans is also making it's way through the soil, though the green beans aren't doing anything yet. It's definitely happening! I updated my gardening spreadsheet. So far the seeds that sprouted, emerged one or two days earlier than the earliest expected time. The older zucchini seeds haven't done anything yet though and I'm thinking they may have failed. I won't give up entirely at this stage cos they still have a few more days (according to the spreadsheet). Actually, in the few hours since first checking the garden this morning and walking past again just now, three more butter bean plants are breaking through to the surface - pretty neat, eh?! Those first two leaves that break the surface of the soil are called cotyledons. Some seeds only have one leave and they are called monocots. Yes, I am full of useless info! How cute are those little gnomer markers! Happy gardening!